Type I IFNs, which include IFN-α, appear to have complex and broad-ranging actions in the central nervous system (CNS) that may result in protection or injury. To better understand these issues, we generated transgenic mice that produce IFN-α1 chronically from astrocytes. These glial fibrillary acidic protein-IFN-α transgenic mice developed a progressive inflammatory encephalopathy, with marked calcium mineralization, meninoencephalitis, gliosis, and neurodegeneration. Many features of this murine encephalopathy resembled those found in certain human encephalopathies of unknown etiology; these diseases, exemplified by Aicardi-Goutières syndrome and some viral encephalopathies, show increased intrathecal production of IFN-α. Our data suggest that IFN-α overproduction may be the primary factor initiating these human diseases. Following intracerebral infection with lymphocytic choriomeningitis virus, glial fibrillary acidic protein-IFN-α mice had significantly increased survival rates associated with markedly reduced virus titers and immune pathology in the brain but normal peripheral CTL responses. Therefore, the production of IFN-α in the CNS can be a two-edged sword that on the one hand confers protection against a lethal viral infection but on the other causes significant injury to the brain. These transgenic mice provide a novel animal model in which to further evaluate the mechanisms that underlie the diverse actions of type I IFNs in the intact CNS. The IFNs are a family of cytokines that include two major subgroups based on their properties and cellular receptors (1, 2), termed type I (IFN-α and IFN-β) and type II (IFN-γ), respectively. In humans, at least 15 IFN-α subtypes have been identified, whereas there is only one gene encoding IFN-β. In vivo, the IFN-αs are produced predominantly by leukocytes (in particular dendritic cells and macrophages), whereas IFN-β is produced by a large variety of cells, including fibroblasts, epithelial cells, and macrophages. Expression of these type I IFNs, which share a common receptor and have closely overlapping biologic actions, can be induced by many factors but particularly by infection with viruses. Type II IFN or IFN-γ is produced by activated T lymphocytes and NK cells and binds to a unique receptor. Although sharing many overlapping actions with type I IFNs, IFN-γ also possesses several activities that are unique and relate particularly to its immunoregulatory functions. In addition to their antiviral actions, IFNs may profoundly affect a variety of functions (1, 2, 3, 4), including cellular metabolism, growth and differentiation, immune function, and tumor development. IFNs exert their biologic effects by binding to specific high affinity cell surface receptors, which then signal a cascade of cellular responses associated with changes in gene expression that lead to an altered cellular phenotype (5). A number of genes are known to be induced in cells following their exposure to IFNs, including 2′,5′-oligoadenylate synthetase (2′,5′-OAS),3 the MX gene, β2-microglobulin, MHC class I and II (induced by IFN-γ only) molecules, and elF-2α protein kinase. Induction of some of these genes is highly specific for IFNs and has led to their use as surrogate markers for the presence of IFNs in different disease states. The protein products of some of these IFN-response genes (e.g., 2′,5′-OAS, elF-2α protein kinase, and MX protein) are known to inhibit viral replication and therefore may contribute directly to the antiviral state conferred on uninfected cells exposed to IFNs. Other protein products of IFN-response genes (e.g., MHC molecules) do not affect viral replication directly but enhance recognition and killing of virus-infected cells by antiviral immune processes. IFN production during viral infection in vivo is therefore an essential factor in the host antiviral response normally being induced within hours of systemic viral infection and decreasing with resolution of the infectious state (5, 6). Expression of the type I IFN genes may be induced in the central nervous system (CNS) in different viral infections, e.g., lymphocytic choriomeningitis virus (LCMV) infection in mice (7). However, the cellular sources for IFN production in the CNS are poorly defined. Glial cells (astrocytes and microglia) have been shown to produce type I IFNs in vitro, suggesting that these cells might provide a local source of IFN production to defend the brain against viral insult (8, 9). There is evidence to suggest that the type I IFNs may be toxic to the brain. Thus, when used in systemic pharmacologic therapy, IFN-α can produce a flu-like syndrome; behavioral and cognitive impairments; and, in rare circumstances, cerebral coma and death (10, 11). In addition, increased intrathecal IFN-α has been associated with certain familial encephalopathies, including the Aicardi-Goutières syndrome (12, 13, 14) and Cree encephalitis (15) (P. Lebon and D. Black, unpublished observations). However, whether IFN-α has a cause and effect role in the development of these and other neurologic disorders is not clear. Therefore, the aim of the present study was to generate transgenic mice (termed GIFN mice) with astrocyte-targeted expression of IFN-α in which we could explore 1) the neurologic impact of IFN-α expression in the intact CNS and 2) the antiviral properties of local IFN-α production following intracerebral infection of the transgenic mice with LCMV. The methods used for the construction of the GFAP-IFN-α1 fusion gene and the generation and screening of transgenic mice were similar to those described previously for the generation of GFAP-IL-6 and GFAP-IL-3 transgenic mice (16, 17). Briefly, a murine IFN-α1 cDNA (a kind gift of Dr. E. Zwarthoff, Erasmus University, Rotterdam, the Netherlands) containing the entire coding region was inserted between an upstream SV40 intron and a downstream SV40 polyadenylation sequence, at the SalI site within the first exon of the modified GFAP expression vector. The GFAP-IFN-α transgene was microinjected into the germline of C56BL/6J × BALB/c F1 hybrid mice, and transgenic offspring were screened for integration by tail DNA dot blot hybridization using a 32P-labeled SV40 polyadenylation sequence fragment as probe. Organs were removed and immediately frozen in liquid nitrogen, and poly(A)+ RNA was isolated as described previously (18). Total RNA was extracted directly from frozen tissue or astrocyte cultures with TRIZOL reagent (Life Technologies, Grand Island, NY) used according to the manufacturer’s instructions. RNase protection assay for IFN-α was performed as described previously (7). For Northern blot hybridization, poly(A)+ RNA was denatured, electrophoresed in 1% agarose/2.2 M formaldehyde gels, transferred to nylon membranes, and hybridized overnight at 45°C with 32P-labeled cDNA probes. Probes used were: a 2-kb EcoRI fragment of murine 2′,5′-OAS cDNA (cDNA kindly provided by Dr. Bryan Williams, Cleveland Clinic Foundation, Cleveland, OH), a 0.6-kb KpnI-SacI fragment of a murine MHC class I (H2Db) cDNA (provided by Dr. P. Petersen, Scripps Research Institute), a 0.932-kb fragment of murine MHC class II (Iabα) chain (19), and a 0.26-kb fragment of the murine β-actin gene (20). Astrocytes were prepared from cerebrum and cerebellum of individual neonatal GIFN-39 transgenic mice (see Results) or wild-type (wt) littermates as described previously (21). The cells were seeded in 25-cm2 Falcon culture flasks (Becton Dickinson, Franklin Lakes, NJ) in complete medium and incubated at 37°C in an atmosphere of 5% CO2 with 95% humidity. After 2 days in culture, conditioned medium was collected for assay of secreted IFN-α. Immunoreactive IFN-α was measured by dissociation-enhanced lanthanide fluoroimmunoassay (7). Briefly, microplates were coated with sheep anti-mouse IFN-α IgG (a kind gift of Dr. Michael Tovey, Centre National de la Recherche Scientifique, Paris, France), incubated with samples or IFN-α standards for 2 h, and then incubated for 1 h with a rat anti-murine IFN-α mAb (0.2 mg/ml; clone 4E-α1; Seikagaku America, Rockville, MD) labeled with europium lanthanide chelate (Wallac Oy, Turku, Finland). After adding enhancement solution (Wallac), fluorescence was measured in a 1234 DELFIA (dissociation-enhanced lanthanide fluoroimmunoassay) Research Fluorimeter (Wallac). A laboratory murine IFN-α standard was routinely used consisting of the medium of culture supernatants of splenocytes stimulated by Sendai virus. This was calibrated against a National Institutes of Health murine IFN-α standard (batch Ga 02-901-511). The biologic assay for IFN-α used a conventional cytopathic effect inhibition assay using crystal violet staining of L cells following infection with vesicular stomatitis virus (22). Brains were removed, and one hemisphere was fixed overnight in ice-cold 4% paraformaldehyde in PBS (pH 7.4). Paraffin-embedded sagittal sections (8 mm) were processed for in situ hybridization as described previously (23). 35S-labeled cRNA to IFN-α1, MHC class I, 2′,5′-OAS, and viral nucleoprotein (NP), respectively, were used as probes. After hybridization and posthybridization washes, sections were exposed to autoradiographic film for 5 to 15 days. For routine histology, organs were removed, fixed in 4% buffered paraformaldehyde and embedded in paraffin, and stained with hematoxylin and eosin. An alizarin red S technique modified from Dahl (24) was used for identification of calcium. Frozen sagittal brain sections (9 mm) fixed in 95% ethanol were incubated in alizarin red S (Sigma, St. Louis, MO) staining solution, rinsed with acid/ethanol, counterstained with Mayer’s hematoxylin (Sigma), and examined by brightfield microscopy. 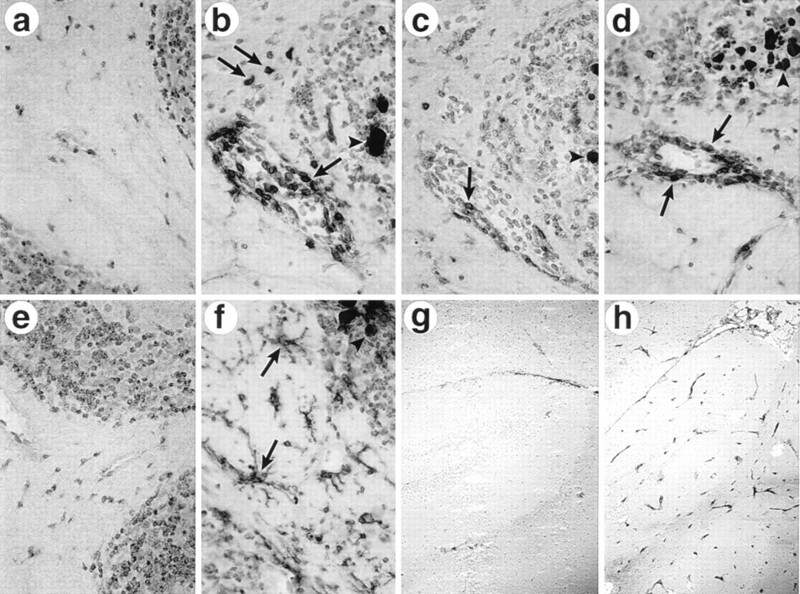 Analysis of patterns of neurodegeneration was conducted as described previously (16, 25) by immunolabeling free-floating vibratome sections with Abs against synaptophysin (Boehringer Mannheim, Indianapolis, IN), a synaptic marker; microtubule-associated protein 2 (MAP2), a dendritic marker (Boehringer Mannheim); GAP 43 (Sigma), a marker of sprouting and regeneration; parvalbumin and calbindin (Sigma), markers of interneurons; and ChAT (Chemicon), a marker for cholinergic neurons. Briefly, sections labeled with MAP2 and synaptophysin were recognized with FITC and analyzed with the confocal microscope, whereas the rest were developed with 3′,3′-diaminobenzidine (Sigma) and analyzed with Quantimet 570C software (16, 25). For statistical analysis, one-way ANOVA with Dunnett’s t test was used. For other immunostains, brains were removed from mice, embedded in OCT compound (Sakura Finetek, Torrance, CA) and snap frozen in liquid nitrogen. Sagittal sections (9 μm) cut with the aid of a cryomicrotome were air dried and stored at −70°C. Immediately before staining, sections were fixed in cold (−20°C) methanol:acetone (1:1) solution for 1 min and then incubated for 20 min in PBS containing 2% FCS (to reduce nonspecific reactivity). Sections were incubated with rat mAb to Mac-1 (TIB126; American Type Culture Collection, Manassas, VA), CD4 (L3T4; PharMingen, San Diego, CA), CD8a (Ly-2; PharMingen), B220 (CD45R, PharMingen), ICAM-1 (YN1/1; kindly provided by Dr. F. Takei, Toronto, Canada), and VCAM-1 (CD106; PharMingen), respectively. Bound Ab was detected with a biotinylated anti-rat mAb (Southern Biotechnology Associates, Birmingham, AL), followed by strepavidin-labeled horseradish peroxidase (Boehringer Mannheim). Staining employed 3′,3′-diaminobenzidine as substrate. Before mounting, sections were counterstained with Mayer’s hematoxylin. Transgenic mice and controls were killed by intracardiac perfusion with a 3% phosphate-buffered glutaraldehyde solution while under deep anesthesia. Blocks for electron microscopy were taken from the cerebral and cerebellar hemispheres. They were postfixed in 1% phosphate-buffered osmium tetraoxide, dehydrated in serial alcohol solutions, and embedded in araldite resin. Thick sections were cut with a Porter Blum microtome and stained with either methylene blue or paraphenylene diamine. Thin sections from selected blocks were cut with diamond knives using a Sorvall ultramicrotome and stained with uranyl acetate and lead citrate before examination by electron microscopy. Because GIFN-39 mice exhibited spontaneous seizure activity, only GIFN-12 mice (see Results) were used in these experiments. At the age used, GIFN-12 mice exhibited minimal neuropathologic alterations; in particular, calcium mineralization and meningoencephalitis were absent. 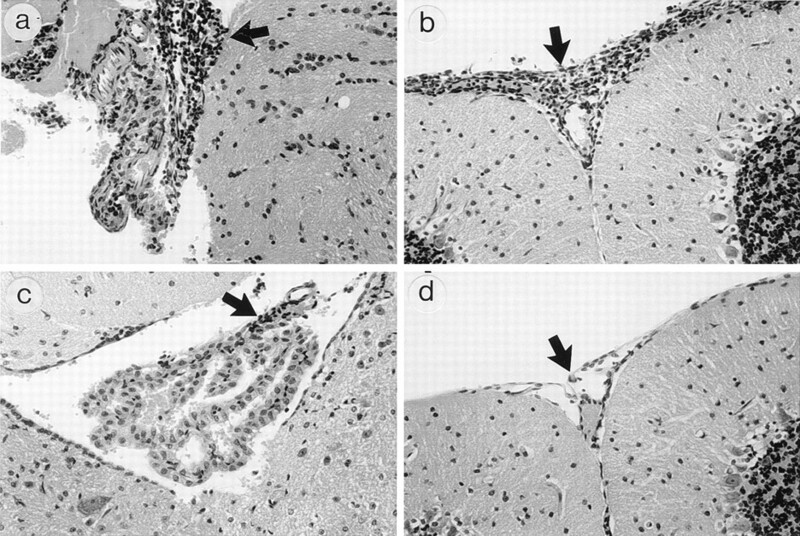 GIFN-12 transgenic mice (6–8 wk old) and wt littermates were inoculated intracranially (i.c.) with 25 μl of serum-free DMEM containing 30 plaque-forming units of LCMV-Arm 53b stock obtained from a triple plaque-purified clone subsequently passaged in BHK cells (26). At indicated times postinfection, mice from each group were killed, and the brain and the spleen were removed and immediately frozen in liquid nitrogen and stored at −70°C pending measurement of LCMV titers. Frozen organs were weighed, homogenized in tissue culture medium M199 containing 10% FCS, and immediately centrifuged to remove debris. Infectious LCMV present in the clarified homogenate was quantitated by plaque assay on Vero cell monolayers as described previously (27). At day 5 postinfection, an additional three surviving infected wt or GIFN-12 mice were killed, and brains were removed and fixed in ice-cold 4% buffered paraformaldehyde solution. After overnight fixation, the tissues were dehydrated, embedded in paraffin, and processed for in situ hybridization and histologic examination as described above. wt and GIFN-12 mice (both MHC haplotype H-2b/d) were infected with LCMV as described above and killed at day 4 or day 6 postinfection. In addition, as a positive control, BALB/c (MHC haplotype H-2d) or wt and GIFN-12 mice were infected (5 × 106 plaque-forming units) i.p. with LCMV and killed at day 7 postinfection. Single-cell suspensions from spleen were prepared in supplemented (2 mM glutamine, 50 μM 2-ME, 50 μg/ml streptomycin, and 50 U/ml penicillin) DMEM containing 10% FBS (Life Technologies). For the determination of T cell cytotoxicity, a standard 6-h 51Cr release assay, as described by Byrne et al. (28), was performed. BALB/c17 (H-2d) and L929 (H-2k) cell lines were infected with LCMV-Arm.53b at a multiplicity of injection of 0.1, and 48 h later they were used as target cells. The effector splenocytes were incubated in triplicate, with target cells at E:T cell ratios of 50:1 and 25:1. The percentage of specific lysis was calculated as 100 × (cpm release by CTL − cpm spontaneous release)/(cpm total release − cpm spontaneous release). Two stable lines of mice (termed GIFN-39 and GIFN-12) positive for IFN-α transgene integration were generated showing (see below) moderate and low levels of transgene-encoded IFN-α expression, respectively. A number of mice from the GIFN-39 line were found to exhibit physical differences from their wt littermates, in that they were runted, ataxic, moribund, and susceptible to seizures beginning as early as 4 wk of age, and they progressed to death at 5 to 10 mo of age. Mice from the GIFN-12 line had a similar but much less severe phenotype seen in some older (8–12 mo old) mice that exhibited loss of weight and became moribund but in which seizures were rarely observed. Transgene-encoded expression of IFN-α was demonstrated in the CNS of both GFAP-IFN-α lines. By RNase protection assay, there was no detectable expression of IFN-α1 mRNA in the brain of wt (nontransgenic) control littermates (Fig. 1⇓a). However, IFN-α mRNA was found to be expressed in the brain of GIFN-39 mice and, at somewhat lower levels, in GIFN-12 mice. Similar to wt control mice, in the GIFN mice from both lines, expression of the IFN-α mRNA was not detectable in the peripheral organs, spleen, kidney, and liver. In situ hybridization analysis (see Fig. 5⇓b) revealed IFN-α mRNA expression detectable in the cerebellum, neocortex, and thalamus of GIFN-39 mice. Expression of IFN-α mRNA was not detectable by this method in brain from either GIFN-12 or wt mice. Astrocyte cultures isolated from the cerebrum and cerebellum of GIFN-39 mice produced significant levels of immunoreactive and bioactive IFN-α. In contrast, supernatants obtained from similarly prepared cultures from wt mice were found to contain little detectable IFN-α activity (Fig. 1⇓b). Brain-restricted expression of the IFN-α transgene. a, IFN-α mRNA expression was demonstrated by RNase protection assay using poly+ RNA (2 μg) from brain, spleen, kidney, and liver of a wt, GIFN-12, or GIFN-39 mouse (2 mo of age). b, IFN-α immunoreactive protein and IFN bioactive protein were present in supernatants of astrocyte cultures from cerebrum (C) and cerebellum (CB) of GIFN-39 but not of wt mice. Each column represents the mean ± SEM (n = 5). A striking neuropathologic finding in the GIFN mice was the progressive accumulation of mineral deposits in the cerebellum and basal ganglia of 4- to 6-mo-old GIFN-39 and 10- to 12-mo-old GIFN-12 mice. The presence of insoluble calcium in these inclusions was confirmed by alizarin red S staining (Fig. 2⇓, c and d). Scanning electron microscopy with energy-dispersive x-ray microanalysis further indicated that these inclusions were composed almost entirely of calcium and coprecipitating phosphorus (data not shown). In its advanced stages, calcification in the basal ganglia was reflected, at a microscopic level, by massive deposition of material obliterating much of the parenchyma and extending across the midline into the adjacent basal ganglia region (Fig. 2⇓d). Calcium mineralization in the granular layer of the cerebellum consisted of concentric, often laminated deposits (Fig. 2⇓c). In the GIFN-39 mice, calcium mineralization was observed in perivascular regions as well as in vessel walls as early as 4 wk after birth. Although some of the deposits could be localized to the cytoplasm of individual endothelial cells, these aggregates also formed within the neuropil and were flanked by clumps of glial filaments, suggesting they may have originated within astrocytes. Pathologic changes in the CNS of GFAP-IFN-α transgenic mice. a–d, Alizarin red-S staining of brain sections from wt and GIFN-12 (age 12 mo). Note the extensive calcification in cerebellum (c) and thalamus (d) from the GIFN-12 mouse compared with the respective brain areas (a and b) from wt mice (all original magnifications, ×126). Patterns of neurodegeneration in 10-mo-old GIFN-12 (low expressor) and 3-mo-old GIFN-39 (high expressor) mice (e–k). e, Strong GAP 43 immunoreactivity in hippocampus inner molecular layer of wt mice (arrows) and laminar pattern in the cortex (C). f, Marked decrease in GAP 43 immunoreactivity is evident in this specimen from the GIFN-39 animal (arrows). Quantimet C analysis of GAP 43 immunoreactivity (g and h) revealed a significant (∗, p < 0.05) decrease in the indicated brain regions from GIFN-12 and GIFN-39 mice compared with similar brain regions in wt control animals. i, Intense ChAT immunoreactivity representing cholinergic cells in the septal nucleus of wt mice. j, Shrinkage of cholinergic cells as well as a marked decrease in ChAT immunoreactivity in the same brain region from the GIFN-39 mouse. k, Quantimet C analysis of ChAT-positive cells in wt, GIFN-12, and GIFN-39 mice. The number of ChAT-positive cells was found to be significantly (∗, p < 0.05) reduced in both transgenic lines compared with wt control specimens. The impact of the chronic production of IFN-α by astrocytes on neuronal structure was also analyzed. To evaluate the overall integrity of the synaptodendritic organization, sections were immunolabeled with Abs against MAP2 and synaptophysin. Confocal analysis of the sections showed that in 8- to 12-mo-old GIFN-12 mice, there was a moderate decrease in synaptophysin and MAP2 immunoreactivity in the cortex and hippocampus. In contrast, in 4- to 6-mo-old GIFN-39 mice, there was a widespread loss of these markers. In particular, the molecular layer of the hippocampus and cortical areas receiving input from the basal forebrain were affected (data not shown). These neurodegenerative changes were accompanied by astrogliosis as revealed by the GFAP immunostains (data not shown). Since these areas receive cholinergic innervation, we analyzed the integrity of the cholinergic system by immunolabeling serial sections with a choline acetyltransferase Ab (Fig. 2⇑). This analysis showed a transgene dose-dependent decrease in the number of cholinergic neurons in the septal nuclei and basal forebrain (Fig. 2⇑, i–k). Since these terminals are known to express high levels of GAP 43, a molecule associated with neuronal sprouting, sections immunolabeled with an Ab against this molecule showed a profound loss of this marker in both the hippocampus and the neocortex (Fig. 2⇑, e–h). This indicates that degeneration of cholinergic cells is accompanied by an inability to mount an appropriate sprouting response. Evaluation of the integrity of the interneurons and other neuronal populations was conducted using Abs against parvalbumin and calbindin. These studies showed that both calbindin- and parvalbumin-immunoreactive neurons in the cortex and hippocampus were not altered in GIFN-12 mice but were reduced in GIFN-39 mice (data not shown). 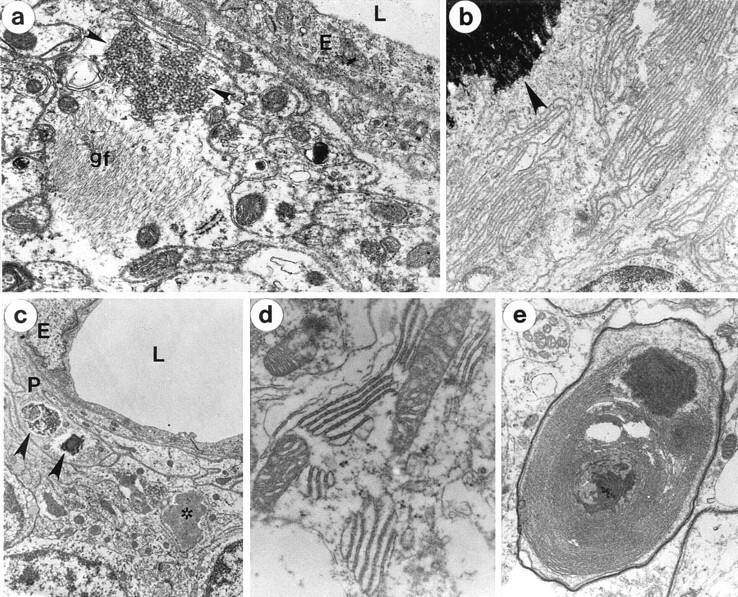 At the untrastructural level, electron-dense debris were present in the walls of vessels, being located in pericyte cytoplasm as well as within endothelia (Fig. 3⇓c). Ependymal cells lining the ventricles and on the epithelial surface of the choroid plexus also showed abnormalities consisting of swelling and irregular configuration of their cell surfaces. In areas of inflammatory cell infiltration, astrocytes contained clusters of glial filaments that stained intensely for GFAP (data not shown) and were hypertrophied, suggesting that these cells were activated. Some perivascular astrocytes contained masses of tubulovesicular intracytoplasmic material identical with the fine structure of so-called tubuloreticular or “lupus” inclusions (29, 30). These inclusions had curvilinear profiles, and some were seen in astrocytes adjacent to clumps of glial filaments (Fig. 3⇓a). A second type of inclusion was observed in the endoplasmic reticulum (ER) of many cells and consisted of tubular infoldings of cisternae (Fig. 3⇓d). These inclusions resembled “cylindrical confronting cisternae” described in cells with tubuloreticular inclusions (30). Another noteworthy change in the transgenic mice was a degeneration of myelinated axons in the cerebellar white matter. At the light microscopic level, this manifested as bubbly disintegration of the myelin sheath, whereas electron microscopic examination revealed swollen axons containing masses of organelles, most prominently lysosomes, accumulated in a manner consistent with wallerian degeneration. Some axons contained profiles resembling ER membrane arranged concentrically inside the myelin sheath, obliterating the axonal cytoplasm (Fig. 3⇓e). Similar membranous complexes appeared elsewhere in the neuropil (Fig. 3⇓b). Abnormal membrane formation was noted in the ER of many cells. Primary demyelination was not observed in the tissue examined. Ultrastructural alterations (a–e) in the CNS of a GIFN-39 transgenic mouse (age 2 mo). Structural changes in an astrocyte include tubuloreticular inclusions (a, arrowheads) and masses of glial filaments (gf). The adjacent capillary endothelial cell (E) and its lumen (L) are also shown. Within the endothelial cell, intermediate cytoplasmic filaments are prominent, a reaction to injury. c, Around the lumen (L) of a vessel, endothelial cells (E) and pericytes (P) contain electron-dense inclusions (arrowheads). The adjacent neuropil also contains an amorphous deposit (*). d, Atypical endoplasmic reticular structures. The outer membrane of the ER is closely contiguous to a mitochondrion, and the ER contains abnormal cysternal configurations resembling cylindrical confronting cisternae. b, Accumulation of membranous complexes in the neuropil appear in the vicinity of a calcified deposit (arrowhead). e, A conspicuously thin myelin sheath surrounds a swollen axis cylinder within which proliferating membranous debris has accumulated, replacing the normal cytoplasm. Further histologic examination of brain from symptomatic GFAP-IFN-α mice revealed inflammation with discrete perivascular accumulations of mononuclear cells (see below). No evidence of hemorrhage was found; however, blood vessels were dilated, and endothelial cell hypertrophy was apparent. The identity of the inflammatory cells present in the brain of the GFAP-IFN-α mice was determined by immunohistochemical staining with specific Abs. Different leukocyte subsets were identified in the perivascular cuffs, including CD4+ T cells (Fig. 4⇓b), CD8+ T cells (Fig. 4⇓c), and B220+ B cells (Fig. 4⇓d). In addition, CD4+ T cells were also observed in many areas of the brain, including in the meninges, in the dentate gyrus of the hippocampus, scattered throughout the brain parenchyma, and in the choroid plexus of both older (6–12 mo old) GIFN-12 and younger (1–6 mo old) GIFN-39 mice (data not shown). In addition to the immune cells, a generalized activation of microglia was observed throughout most of the brain, as revealed by increased expression of the microglia/macrophage marker Mac-1 as well as by marked hypertrophy of the microglia (Fig. 4⇓f). During inflammatory responses, multiple factors contribute to leukocyte recruitment and trafficking through the CNS. Cell adhesion molecules, such as ICAM-1 and VCAM-1, both members of the Ig superfamily, have been implicated in this process (31, 32). In the GFAP-IFN-α transgenic mice, markedly increased expression of ICAM-1 (Fig. 4⇓h) but not VCAM-1 (data not shown) by the cerebrovascular endothelium was seen throughout the brain. Inflammatory cell infiltration in GFAP-IFN-α mice. Immunophenotyping (a–h) of cell infiltrates in the brain of a GIFN-12 mouse (age 6 mo) showed the presence of CD4+ T cells (b), CD8+ T cells (c), and B220+ cells (d), whereas no immunoreactivity was detected in wt brain (a). (f), Compared with wt (e), markedly increased Mac-1 expression and cellular hypertrophy were evident in microglia in the CNS of the GIFN-12 specimen. Compared with wt (g), significantly increased ICAM-1 expression was observed on the vascular endothelium in the hippocampal region of the GIFN-12 brain (h). The cellular response to IFNs is known to involve the induction and the synthesis of a number of proteins that directly or indirectly mediate many actions of IFNs. We examined the expression of two prototypic IFN-α responsive genes, 2′,5′-OAS and MHC class I. As shown by Northern blot hybridization (Fig. 5⇓a), compared with nontransgenic controls, a transgene dose-dependent increase in the expression of both of these genes was observed in the brain of GFAP-IFN-α transgenic mice. A slight increase in cerebral MHC class II gene expression was also noted in the GIFN-39 mice. In peripheral organs, small increases in the expression of these IFN-responsive genes were seen variably in the spleen and the liver but not the kidney of the GFAP-IFN-α mice. By in situ hybridization (Fig. 5⇓b), a diffuse pattern of expression was observed throughout the brain for the MHC class I and 2′,5′-OAS RNA. This was particularly evident in the GIFN-39 mice, with high levels of MHC class I RNA expressed in the olfactory bulb, cortex, hippocampus, thalamus, and choroid plexus, whereas expression of 2′,5′-OAS RNA was highest in dentate gyrus, choroid plexus, ependyma, and the granular cell layer of the cerebellum. Expression of the MHC class I and 2′,5′-OAS genes is increased in the brain in GFAP-IFN-α transgenic mice. 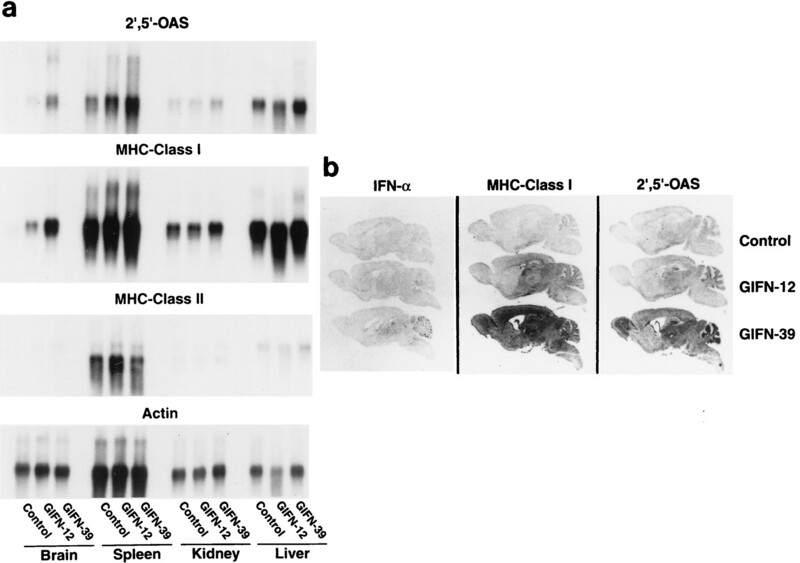 a, Northern blot hybridization analysis shows a transgene dose-associated increase in MHC class I and 2′,5′-OAS in the brain but not the spleen, kidney, or liver of the GFAP-IFN-α mice compared with wt controls. b, By in situ hybridization, a transgene dose-associated increase in MHC class I and 2′,5′-OAS gene expression in the brain of the GFAP-IFN-α mice was observed. Expression of IFN-α RNA was only detectable in the GIFN-39 specimen and was localized predominantly to the cerebellum and thalamus. With the exception of the MHC class I RNA, which was expressed at high levels throughout the brain of the GIFN-39 specimen, the expression of the 2′,5′-OAS and MHC class I RNAs overlapped somewhat with the expression of the IFN-α. IFN-α is implicated in the host defense against virus infection. To assess the antiviral actions of IFN-α in vivo, 6- to 8-wk-old GIFN-12 mice and wt littermates were inoculated i.c. with a normally lethal dose of LCMV. By day 8 postinfection, 23 of 24 control littermates had succumbed compared with 10 of 23 GIFN-12 mice (Fig. 6⇓a). Surviving LCMV-infected GFAP-IFN-α mice remained alive at 28 days postinfection, at which time no titerable virus or viral NP (determined by RNase protection assay) could be detected in the brain (data not shown). Analysis of viral titers in the brain at days 3 and 5 postinfection revealed significantly reduced levels of LCMV in GIFN-12 mice compared with controls (Fig. 6⇓, b and c). In contrast, in spleen at day 3 postinfection, LCMV titers were similar for the GIFN-12 and wt animals (Fig. 6⇓d). By in situ hybridization, the level and distribution of LCMV NP RNA was observed to be also considerably reduced in the brain of infected GIFN-12 mice (Fig. 6⇓e). Protection from lethal LCMV infection in GFAP-IFN-α mice. a, Survival data for wt and GIFN-12 mice infected intracerebrally with a lethal dose of LCMV showing increased survival for the transgenic mice. Data shown were pooled from two independent experiments. LCMV titers in brain (b and c) and in spleen (d) of infected wt or GIFN-12 mice showed markedly reduced viral load in the brain but not in the spleen of the GIFN-12 animals. e, In situ localization of LCMV NP RNA in the brain at day 5 postinfection, revealing considerably reduced expression of the viral NP in brain from the GIFN-12 mice. The clearance of LCMV from infected mice is known to be mediated by MHC class I-restricted antiviral CTL. These cells are also responsible for causing the fatal lymphocytic choriomeningitis that accompanies intracranial infection (33). We therefore examined whether CTL responses were altered in the GIFN-12 mice at day 4 and day 6 following intracranial infection with LCMV (Fig. 7⇓). Although there was some killing of uninfected and infected MHC-incompatible (H-2k) target cells, which presumably reflected NK cell activity, increased MHC class I-restricted (H-2d) lysis of LCMV-infected target cells was observed at day 6 but not at day 4 (data not shown) postinfection in both infected wt and transgenic mice. However, no significant difference was observed in the efficiency of killing between the two groups of animals, indicating that CTL responses developed normally in the periphery of the LCMV-infected transgenic mice. MHC class I-restricted anti-LCMV CTL activity is not altered in LCMV-infected GFAP-IFN-α mice. CTL killing was assessed using uninfected or infected MHC-compatible (H-2d) and MHC-incompatible (H-2k) target cells. Each bar in the histogram represents the CTL activity analyzed for an individual mouse. The CTL activity was determined for mice at day 7 following i.p. inoculation with LCMV (d7 i.p.) or at day 6 following intracranial inoculation (d6 i.c.). The characteristic disease course and death of the mouse with lymphocytic choriomeningitis is the result of an immune-mediated process. We therefore examined the brain from LCMV-infected GIFN-12 or wt mice to assess the degree of immune pathology. At day 6 postinfection in wt mice, extensive mononuclear cell infiltration was observed in the meninges, choroid plexus, and ependyma (Fig. 8⇓ a and b). In contrast, in GFN-12 mice, the degree of mononuclear cell infiltration in these brain regions was considerably less, with only modest numbers of inflammatory cells being discernible (Fig. 8⇓, c and d). Thus, the reduction in viral load in the CNS of the GIFN-12 mice was paralleled by a reduction in the severity of the immune pathology. 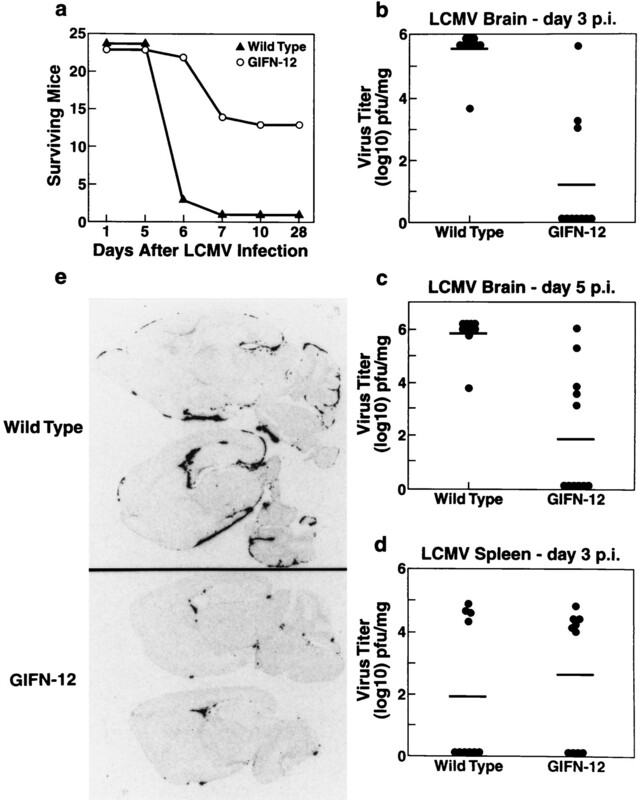 Reduced immune pathology in the brain of LCMV-infected GFAP-IFN-α mice. Brain specimens from wt (a and b) or GIFN-12 (c and d) mice were analyzed at day 5 postinfection. In the wt specimens, extensive mononuclear accumulation (arrows) can be seen in choroid plexus (a) and meninges (b). In contrast, in the GIFN-12 specimens the degree of mononuclear cell accumulation (arrows) is considerably reduced in the choroid plexus (c) and meninges (d). Hematoxylin and eosin-stained sections; original magnification, ×312). We show here that prolonged astrocyte expression of IFN-α in the CNS of transgenic mice was associated with the development of an adult-onset, progressive inflammatory encephalopathy, with marked calcium mineralization, meningoencephalitis, gliosis, and neurodegeneration. A number of observations indicated that the genesis of this neurologic disorder was directly attributable to the actions of IFN-α. First, expression of transgene-encoded IFN-α RNA and bioactive protein was demonstrated in the CNS. Second, both the clinical severity and neuropathology correlated with the levels and distribution of transgene-encoded IFN-α. Third, cerebral expression of the known IFN-responsive genes 2′,5′-OAS and MHC class I were significantly increased. Fourth, many of the clinical and pathologic findings in the GFAP-IFN-α mouse were distinct from those seen in similarly developed transgenic mice expressing other cytokines under the control of the murine GFAP promoter, including IL-6 (16), IL-3 (17) and TGF-β (34). In many respects, the neuropathologic findings in the GFAP-IFN-α mouse recapitulate those found in a variety of human encephalopathies in which there is elevated intrathecal production of type I IFN or IFN-α. These include the familial disorders such as Aicardi-Goutières syndrome (12, 13, 14), Cree encephalitis (P. Lebon and D. Black, unpublished observations), and some congenital viral encephalopathies (35). Our findings, therefore, provide strong support for the proposition (14) that IFN-α is a primary causative factor in these human disorders and establish the GFAP-IFN-α transgenic mouse as a unique animal model to dissect the molecular mechanisms involved in the neuropathogenic actions of IFN-α. The cerebral calcification observed in the GFAP-IFN-α mice and the human disorders alluded to above may represent a specific response in the brain to the presence of this cytokine. Pronounced calcium mineralization was also found in the testis of mice with transgenic expression of IFN-α1 in this organ (36). Although IFN-γ shares many overlapping properties with IFN-α, chronic expression of this cytokine by oligodendrocytes in transgenic mice was not reported to be associated with cerebral calcification (37, 38). However, the exact mechanisms involved in the IFN-α-induced calcium mineralization process are unknown but likely emanate from a severe disturbance in cellular calcium metabolism. Whether this disturbance is due to the direct actions of IFN-α or is secondary to the other pathologic alterations is unclear. In the early stages of calcification, cerebral blood vessels in the GFAP-IFN-α mice were a prominent site of calcium mineralization, indicating that changes in cerebrovascular endothelium may be critical in the development of the mineral deposits. Later, other cells likely contribute, including astrocytes and neurons, as dense cytoplasmic calcium deposits were clearly visible in these cells by electron microscopy. At the subcellular level, we observed extensive morphologic changes affecting the ER in endothelial cells, astrocytes, and neurons. In some cases, massive expansion of the ER congested axonal processes and could have been a cause of neuronal dysfunction and loss. The ER is known to be a major target for IFN-α action both in vitro and in vivo, where morphologic alterations and inhibition of ER-associated enzymes has been reported (29, 39, 40). Tubuloreticular inclusions and cylindrical confronting cisternae are unusual structural formations arising from the ER that are typically observed in leukocytes and endothelial cells during viral infections (e.g., HIV infection and in autoimmune diseases such as systemic lupus erythematosis (reviewed in 30 . These formations have also been observed in various neurologic disorders including HIV encephalopathy (41) and Alzheimer’s disease (42). The function of these structures is an enigma; however, their formation is known to be induced specifically by IFN-α (39). Consistent with this, tubuloreticular inclusions and cylindrical confronting cisternae were observed in astrocytes and cerebrovascular endothelial cells in the GFAP-IFN-α mice. The ER plays a central role in regulating cytoplasmic calcium and, therefore, its perturbation by chronic exposure to IFN-α may contribute to the calcification observed in the CNS of the GFAP-IFN-α mice. Type I IFNs are important immunoregulatory molecules that exert both positive and negative effects on many limbs of the immune response (reviewed in 43 , including modulation of B cell function and Ab production, inhibition of T cell proliferation, enhancement of T cell and NK cell cytotoxicity, and inhibition of delayed-type hypersensitivity. The systemic administration of type I IFNs in some patients with multiple sclerosis has proven to be an effective means of therapy, the basis for which appears to involve, in part, the counterregulatory immune actions of these cytokines (10, 44, 45). In the present studies, the chronic, localized production of IFN-α by astrocytes was associated with the existence of a number of cellular and molecular changes characteristic of a chronic inflammatory process. Thus, at the cellular level, progressive meningoencephalitis involving CD4+ and CD8+ T cells and B cells, cerebrovascular endothelial cell activation, and marked gliosis with both structural and functional activation of the astrocytes and microglia were prominent, whereas at the molecular level, up-regulation of both the MHC class I and ICAM-I genes was observed. The findings therefore highlight a propensity of IFN-α to promote the recruitment of lymphocytes (particularly those belonging to the CD4+ subset) into the brain. 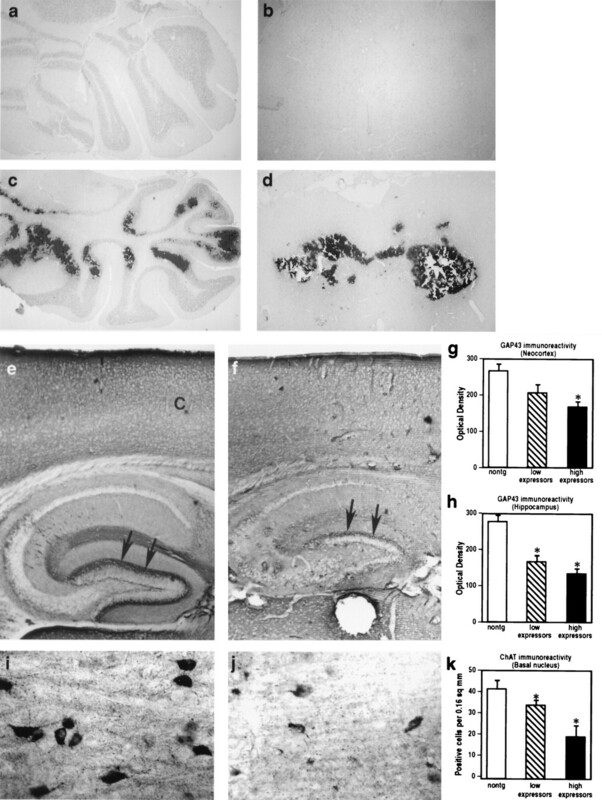 GFAP-IFN-α mice exhibited significant changes in neuronal morphology and loss of specific neurons, including cholinergic neurons; injury to and loss of this population is also seen in Alzheimer’s disease. The cause of these neuropathologic changes is likely to be complex, involving direct actions of the transgene-encoded IFN-α, as well as other indirect factors. Thus, as indicated above, the presence of IFN-α-associated morphologic structures within some neurons (i.e., tubuloreticular inclusions) suggests a direct toxicity of the cytokine. Neuronal damage may have been further compounded by either seizure or hypoxia-related injury. It is also conceivable that neuronal injury could have been inflicted by the associated chronic cerebral inflammatory response in these mice. In regard to this latter point, chronic inflammation involving T cells caused pancreatic β cell destruction in transgenic mice in which IFN-α expression was directed to the islets of Langerhans under the transcriptional control of the rat insulin promoter (46). Given the parallels between the GFAP-IFN-α mouse model and a number of human neurodegenerative disorders with underlying chronic inflammation (e.g., Aicardi-Goutières syndrome (14, 47) and HIV encephalitis (48)), the mechanisms for the neuronal demise are of considerable interest and are amenable to more detailed study in this transgenic animal model. IFN-α is a prototypic antiviral cytokine that is of crucial importance for survival and recovery from acute viral infections (49, 50). The IFN-α transgenic mice represent a useful tool from which to further explore the antiviral actions of the type I IFN in vivo. Previous studies using neutralizing Abs have established a pivotal role for the type I IFNs in the pathogenesis of intracranial LCMV infection (51, 52). Here we clearly established that preexisting astocyte expression of IFN-α in the CNS can afford a significant level of protection against the lethal consequences of LCMV infection. This protection was associated with a marked reduction in the levels of infectious virus and distribution of LCMV NP in the brain. Consistent with a direct antiviral effect of the transgene-encoded IFN-α, the reduced CNS LCMV load occurred early after infection before the appearance of detectable CTL activity and infiltration of the brain with mononuclear cells. The basis for the inhibitory effect of IFN-α on LCMV replication is not known. In general, the molecular mechanisms involved in IFN-α inhibition of viral replication are not well understood (3, 50). IFN-α is known to induce the expression of a number of genes, including 2′,5′-OAS, shown here to be elevated in the brain of the GFAP-IFN-α mice, that are capable of inhibiting different steps in the viral replication pathway (53). In any event, the GFAP-IFN-α mice offer new opportunities for deciphering the mechanism(s) for the antiviral actions of IFN-α in vivo. The anti-LCMV-specific CD8+ CTL response that targets the brain after LCMV infection is responsible for the demise of the host (33, 54). In the LCMV-infected GFAP-IFN-α mice, the severity of the immune pathology was considerably reduced and was therefore likely to be a prime factor contributing to the increased survival of these mice. The reduced immune pathology most likely is directly consequent to the diminished LCMV load observed in the brain of the transgenic mice. It has been suggested previously that the CNS viral load plays a key role in the targeting CTLs to the CNS following intracranial LCMV infection (51, 52). An alternative explanation for the decreased immune pathology in the brain of the LCMV-infected GFAP-IFN-α mice is that it may have been due to suppression of the antiviral immune response. However, this possibility seems unlikely. 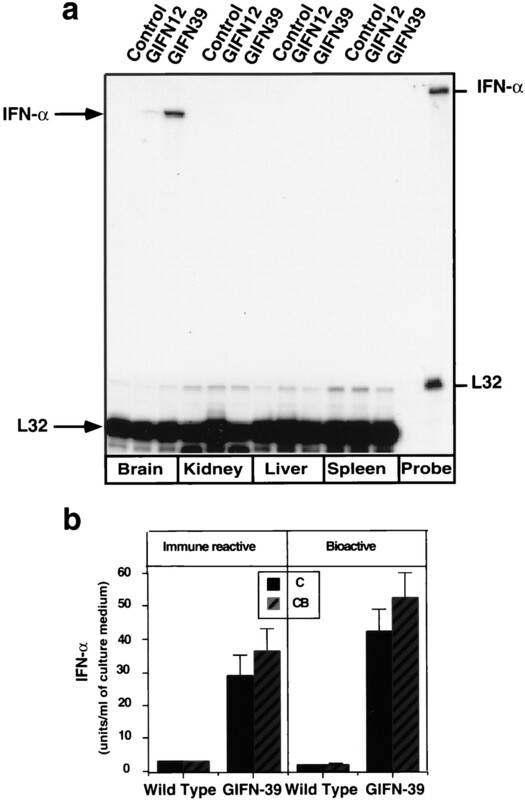 First, surviving LCMV-infected GFAP-IFN-α mice were able to clear the virus from the spleen and the brain, indicating that the CTL response was not impaired in these animals. Secondly, we observed that in LCMV-infected GFAP-IFN-α mice, CTL activity was comparable with similarly infected wt control mice. Therefore, the GFAP-IFN-α mice are able to mount an effective anti-LCMV directed CTL response that is not compromised by the presence of chronic IFN-α production in the CNS. In conclusion, this report describes a novel transgenic model for the chronic astrocyte-targeted expression of IFN-α. The findings underscore the pleiotropic nature of this cytokine, which caused a spectrum of molecular and cellular CNS alterations and induced an inflammatory encephalopathy. This disorder is remarkably similar to certain human encephalopathies with documented elevations in intrathecal IFN production and support the notion that IFN-α is a probable primary pathogenic agent in these human diseases. The findings also highlight the concept that IFN-α on the one hand can confer protection against a lethal neurotropic virus infection, while on the other, it can induce CNS injury and neurologic disease. Therefore, these transgenic mice provide a unique model in which to further evaluate the mechanisms that underlie the diverse actions of type I IFNs in the intact CNS. Finally, the clinical implications of our findings are wide ranging and include the possibility for anti-IFN therapy for patients with encephalopathies involving the inappropriate intrathecal production of IFN-α and for better understanding and prevention of the CNS toxicity that limits the effective therapeutic use of type I IFNs. We thank Carrie Kincaid for her help with the virus titration assays. We also thank Megan Benedict for the maintenance and screening of the transgenic mice. ↵1 This work was supported by Public Health Service Grants MH 47680 (to F.E.B. and I.L.C.) and AI 27028 (to D.E.H. and J.L.W.) and by a Whittier Foundation grant (to F.E.B.). Y.A. was the recipient of a fellowship from the Fondation pour la Recherche Medicale and the Philippe Foundation. D.E.H. was supported by National Institutes of Health Postdoctoral Training Grant AI 07354. M.-L.E. was supported by the Swedish Medical Research Council. This is manuscript 11171-NP from the Scripps Research Institute. ↵3 Abbreviations used in this paper: 2′,5′-OAS, 2′,5′-oligoadenylate synthetase; CNS, central nervous system; GFAP, glial fibrillary acidic protein; LCMV, lymphocytic choriomeningitis virus; NP, nucleoprotein; ER, endoplasmic reticulum; MAP2, microtubule-associated protein 2; wt, wild-type.